Reasons Why You Should Consider the ENVY Photo 7858 All-in-One Printer (Certified Refurbished) Designed to help you be creative, stay productive and save time, HP ENVY Photo 7858 wireless all-in-one is well suited for both home and office use. Finish projects fast, and count on borderless, lab-quality photos and laser-quality text for an affordable price with this inkjet printer. A Printer As Connected As You Are Print directly from your smart device with HP's mobile ePrint. Printer Specs Technology: HP Thermal Inkjet. Resolution: Black (best): Up to 1200 x 1200 rendered dpi (when printing from a computer); Color (best): Up to 4800 x 1200 optimized dpi color (when printing from a computer on selected HP photo papers and Print in Max dpi) Print speed: Black (ISO): Up to 15 ppm; Color (ISO): Up to 10 ppm First Page Out Black: As fast as 18 sec; First Page Out Color: As fast as 22 sec; Black (Draft): Up to 22 ppm; Color (Draft): Up to 21 ppm. Duty cycle: Monthly, letter: Up to 1000 pages Product dimensions (W x D x H): Minimum: 18.26 x 15.35 x 9.0 in; Maximum: 18.26 x 20.39 x 9.0 in Supported paper sizes: Letter, legal, 4x6 in, 5x7 in, 8x10 in, No. 10 envelopes. Certifications: ENERGY STAR qualified meets federal guidelines for energy efficiency. 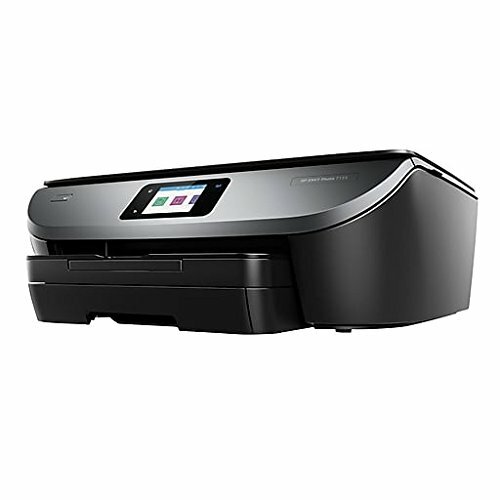 Display: Manage your print, copy and scan jobs directly from your HP ENVY Photo 7858 with the built-in 2.65-inch color IR Wi-Fi, LED touchscreen. What's in the box: HP ENVY Photo 7858 All-in-One, HP 62 Black Ink Cartridge, HP 62 Tri-color Ink Cartridge, Power cord. Printing photos just got easier from social media, the cloud, and your camera-roll gallery.